This past week, my family enjoyed a small, intimate Christmas dinner at home. Instead of the usual Chinese food, we decided to go old-school and do ham, green beans, and potatoes gratine. Now I don't know about you guys, but I have found previous attempts at this dish to be always just not right. It's either too fatty, or too dry, or not cooked enough (even after what seems like days in the oven). So I started to do some research and immediately turned to the Food52 website, which has never let me down. And what do you know, their featured recipe was for potato gratine! Fate has handed me a gem, and I am passing it on to you with some options to make it your own. The best part is: it only takes 30 minutes to cook and you can prepare it ahead of time! Preheat oven to 400° F. Rub the inside of an 8 × 8-inch baking dish with 1 tablespoon of the butter. Smash the garlic with the side of a knife and sprinkle generously with salt. Chop and scrape the garlic into a mushy paste. Combine garlic paste, potatoes, half-and-half, and remaining 4 tablespoons butter (cut into 1/2-inch pieces) in a pot; stir. Season with salt and pepper and grate in a hint of nutmeg. Bring to a boil over medium-high heat while stirring the mixture with a spoon. After 8 to 10 minutes, the potatoes will be a little tender, and the sauce will thicken. Taste and adjust the seasoning as you like. Dump the mixture into the prepared dish — smooth the top as much as possible. At this point, you can hold the dish until you're ready to bake, even overnight in the refrigerator. Cover the gratin with Gruyère and bake until deeply golden brown, about 20 to 30 minutes (longer if chilled overnight). 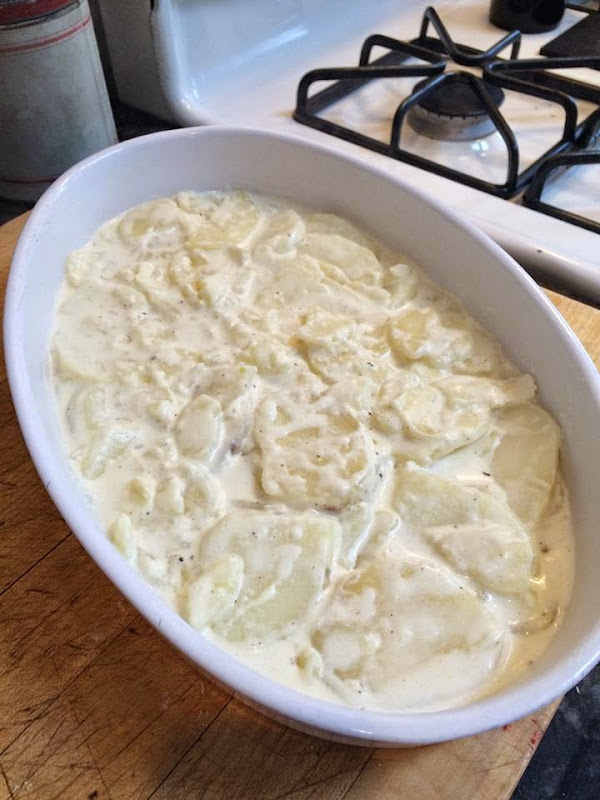 Let the gratin cool and set a little before serving. So, this is the basic recipe, now here are some things you can do to customize this dish. Why not use 1/2 sweet potatoes, or add some zucchini, or thin slices of butternut squash? You can also change the cheese — try cheddar, or goat cheese, or Stilton. Rosemary, thyme, or sage would be interesting and you could also take it in another direction with some sautéed mushrooms or a dribble of truffle oil. Go ahead and explore your options but keep the procedure the same.